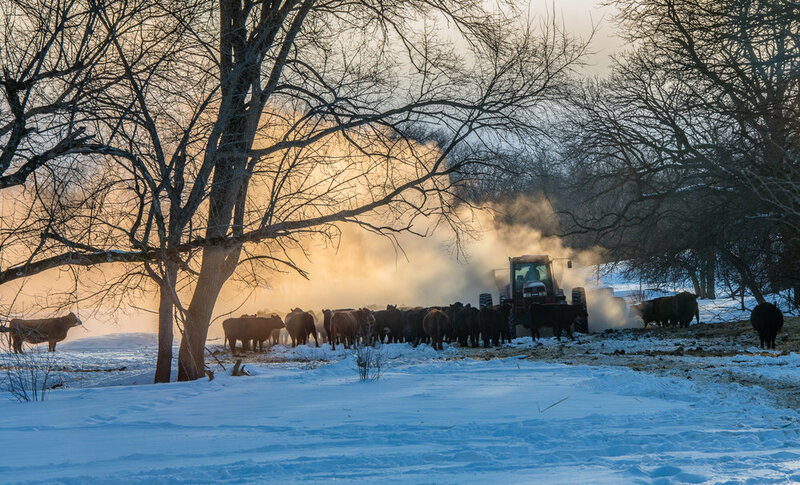 Our "Pictures of the Week" take us to Albia where Bryan Reed worked in subzero temperatures to make sure his cattle were fed, had access to water and were comfortable as cold air spilled from the North Pole creating a record-setting polar vortex across the state. On Jan. 29 and 30, Reed and other area farmers spent long days making sure farm necessities were covered. They had to battle the elements, but they also had to battle machinery. Reed said that with proper shelter, bedding, food and water the cattle with their long winter coats would do fine in the Arctic temperatures. The problem was making sure tractors would start and diesel fuel wouldn't gel in the harsh conditions. That's why preparation for the wicked weather started days earlier. Reed began laying extra hay in sheltered valleys on his farm and providing extra hay just in case he couldn't make it back. "I prayed for diesel fuel to remain in liquid form, strong batteries and good starters in all the tractors that I need for chores every day. Along with that, I also prayed for no equipment breakdowns," Reed says. "I do my best to keep bale rings full and hay unrolled for cattle to lay on for nutrition and comfort, but extra-long hair helps them stay warm and less stressed." Dave Walton, a Wilton area farmer and Iowa Soybean Association director, began preparing many days in advance for what would be minus 25-degree F temperatures with even lower wind chills. "It turned out the cattle were much more comfortable than I was," Walton says. "We prepped several days before the dangerous temperatures arrived by feeding them higher amounts of roughage to fill the rumen." The rumen is a fermentation chamber within the cow’s digestive system, which generates heat. Walton says adding higher amounts of roughage to the cow's diet puts the fermentation process into overdrive and creates more heat. "In addition to increasing the calories in their diet several days in advance, we added significantly more bedding for them to snuggle into," he says. "From their demeanor Wednesday, you could tell they were fat, happy and warm!"